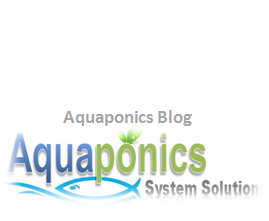 An aquarium heater is critical especially when you are growing fish in an environment of varying temperatures. Any fish specie will have it’s own optimum living temperature where they strive the most. 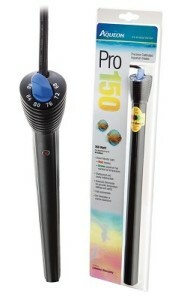 Aquarium heaters aid in maintaining that temperature. It’s always a good idea to choose one that is completely submerged in the water. An indicative power light is always a good option to have so that you’ll know at one glance whether the heater is working. 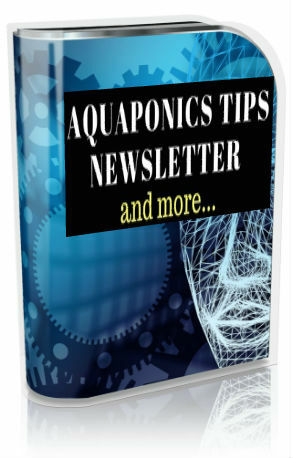 If you’re wondering what are the recommended aquarium heaters are for your aquaponics system, here are 5 of top rated and bestselling on Amazon. Below the table is also more information on each product. aquarium heaters in Amazon at the time this article was being written. This is mainly due to its aluminium core construction that is known to be strong and durable. Another one of its strong attributes is the fact that they do not use glass components which promotes even heat distribution. Electrical thermostat automatically switches itself off if the heater is out of water, and switches on again placed back into water. The heater can be erected horizontally or vertically in the fish tank. There’s also a resistor (a knob) to set the heater to the desired temperature. Has a large control knob which allows you to easily modify the temperature.Clear monitor light – Red for heating and green to let you know that the aquarium has reached the set temperature. Aqueon is confident in the quality of their heaters, this is why they are providing a lifetime warranty. They’re available from 50 watts to 250 watts. resistant glass for fresh or marine water. The glass is also built for extra strength. The power cord is of quality with industrial feel to it. They come with thermo safety controls feature where the heaters will be turned off if the water level is too low. Eheim heaters also come with TruTemp dial where temperature is regulated automatically. 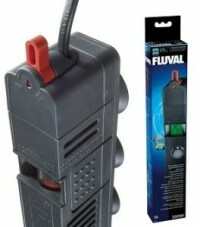 There’s an on/off indicator which allows you easy monitoring and are fully submersible. The heaters comes with the variants of 25 watts to 300 watts. heaters that are constructed with high-quality break resistant glass. ViaAqua Aquarium Heaters also come with built-in thermostat, therefore, they adjust automatically to the pre-set desired temperature. They are very user friendly with clear visible readings in red and are easy to set up with the suction cups included. They come in a 50 watts variant which can handle up to 13 gallon tank (50 liters), with the highest option of 300 watts, that can handle up to 80 gallons (300 liters). submersible and explained earlier, this feature allows for ease of maintaining constant and stable temperatures in your fish tank. 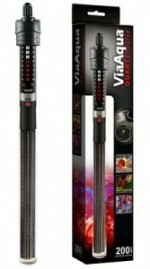 This aquarium heater is incorporated with with double insulation wall and is built from high-quality insulated glass. It’s simple to install by using the included suction cups. Temperature can be easily set via an adjustment knob and is also comes with an operational indication light that is highly visible. They’re available from 50 watts (up to 13 gallon tank capacity) right through to 300 watts (up to 75 gallons). something that come out of a military range of weaponry. Their tough stealth like design sure gives that impression. Real time aquarium temperature via a LCD display. The display changes color when water temperature defers from the pre-set and flashes when there’s a drastic change in water temperature. It’s like a guard dog. 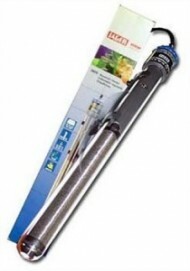 This aquarium heater also come with dual temperature sensors for higher accuracy. Temperature adjustment is allowable up-to 0.5 degrees increments. With the outer guard, fish can not come in contact with the heater. Which is a great feature in keeping the fish save. The heaters can be mounted in any angle that is convenient to you. 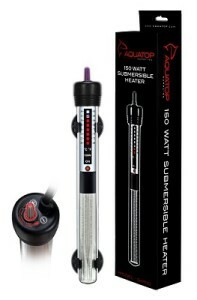 Hagen’s Fluval E Electronic Heaters come with the options from 50 watts to 300 watts, and they all come with a 5 year warranty which is a bargain really. There you have it, my take on some of the most reliable and recommended aquarium heaters you can trust to do the job for you in keeping your fish healthy and happy. 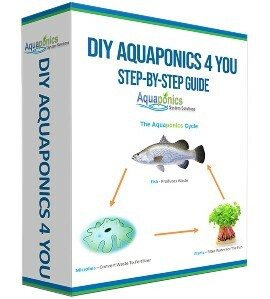 Grab yourself an aquarium heater now before it’s too late!